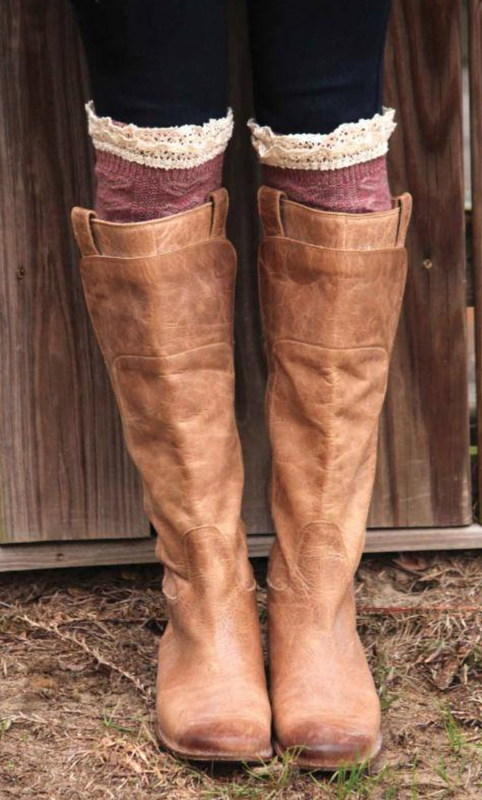 It’s Official, Boot Season is Here! With the official “Opening Day” of Pheasant Season only a few days away, the Countdown to Christmas is upon us. I know a few of you ladies are hunters, but most of the women I know prefer a little different kind of “HUNT!” The hunt is on for finding great Christmas gifts for those you love! At Adrian’s, we have early bird shoppers who started back in May or June and are just wrapping up the finishing touches, and those who are getting started now…Then there are others like myself, who are last minute shoppers and wouldn’t even think of starting until after Thanksgiving! No matter where you fall in the shopping spectrum, we’ll be here to serve you with complimentary gift wrap, gourmet goodies while you shop and an atmosphere that truly celebrates the real meaning of Christmas! 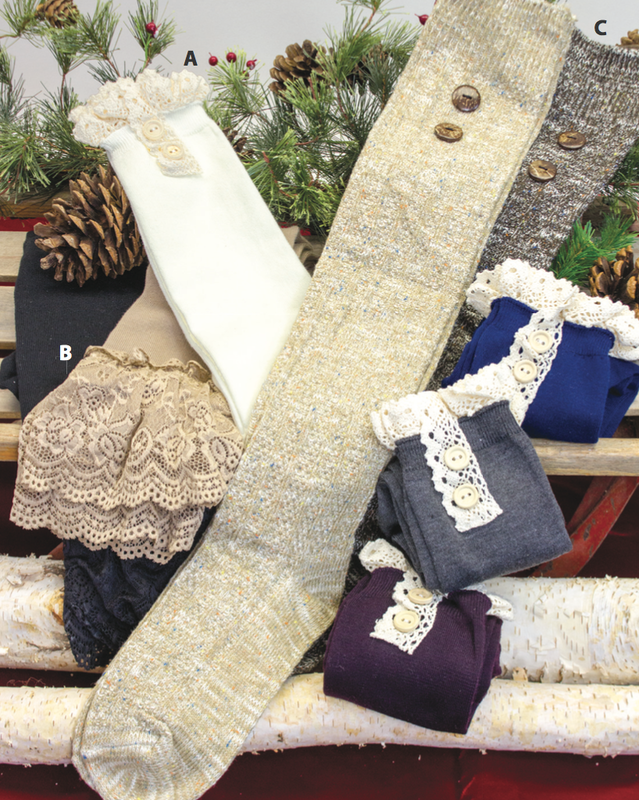 Boot Socks continue to be one of the most popular items at Adrian’s Boutique, and we have dozens of styles and colors to choose from! If you love the soft and fuzzy look, we have those… if you want to layer 2 or 3 pair together, we have that style as well. From lace to crochet to tweeds, solids and more, you’ll find exactly what you need at Adrians. Boot socks are being worn by girls and ladies from every age category. Most of our boot socks are priced from $9.99 – $16.99 with a few exceptions slightly higher. Another very popular item right now are the Blanket Scarves. These can be worn in several different ways (Click here for a VIDEO tutorial), and we have many styles to choose from. Most of these scarves are about $24.99. We also have special BUY ONE – GET ONE FREE pricing on ALL of our $14.99 Scarves (which is about 80% of the scarves in our store). Adrian’s has hundreds to choose from! 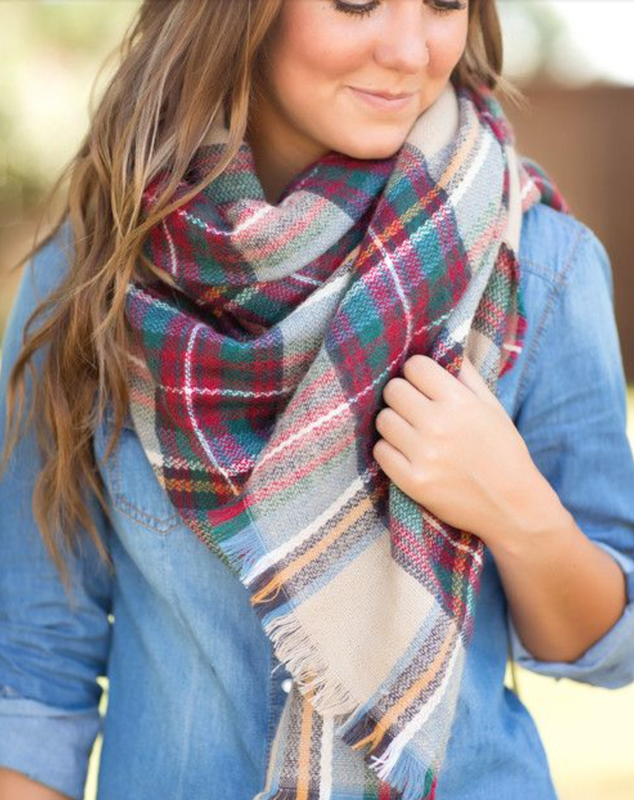 A scarf is a great accent for any outfit and we can help you choose just the right one! Our brand new CHRISTMAS CATALOG arrived inside The Hutchinson News this morning to many residents in Reno County. If you didn’t happen to get one, you’ll want to CLICK HERE to check it out! 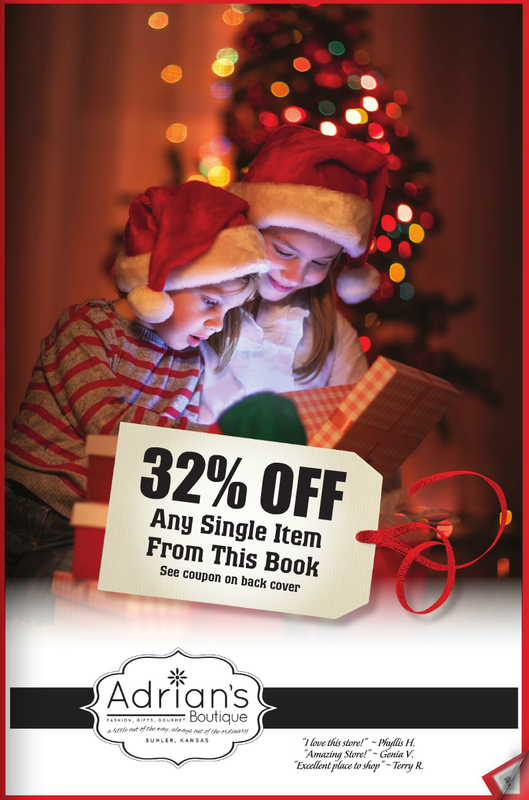 This particular catalog is filled with items at very special prices! These VIP specials are good now through next Monday, or while limited supplies last. These are VIP Prices for our Facebook, Email and Blog Clients…and not advertised in store. To get these special prices, you will need to present either the catalog, or let us know that you received your catalog electronically. Just what will you find in our 2015 Christmas Catalog? Games and Toys for both kids and adults, beautiful clothing, jewelry, gifts, gourmet and of course, holiday decor and goodies! Let Adrian’s help fill your stockings with fun gifts for your family and friends!